← But It’s Expensive to Be Vegan! What an awesome treat to find a bag of polenta on my desk, gifted to me by my thoughtful co-worker who had an overabundance in his pantry! I had a small bag at my house too, but really had never prepared polenta so this was a sign from the universe to get cooking. Polenta (corn grits) is a super quick, easy to prepare, gluten-free treat. It’s very versatile and makes a great side dish. It also makes a great soft crust. I especially like polenta with some flavors and spices added. So deciding what to make with this batch hinged on my current stock in the fridge. I had some portabella mushrooms and a half full jar of marinara sauce. Italian was the way to go. 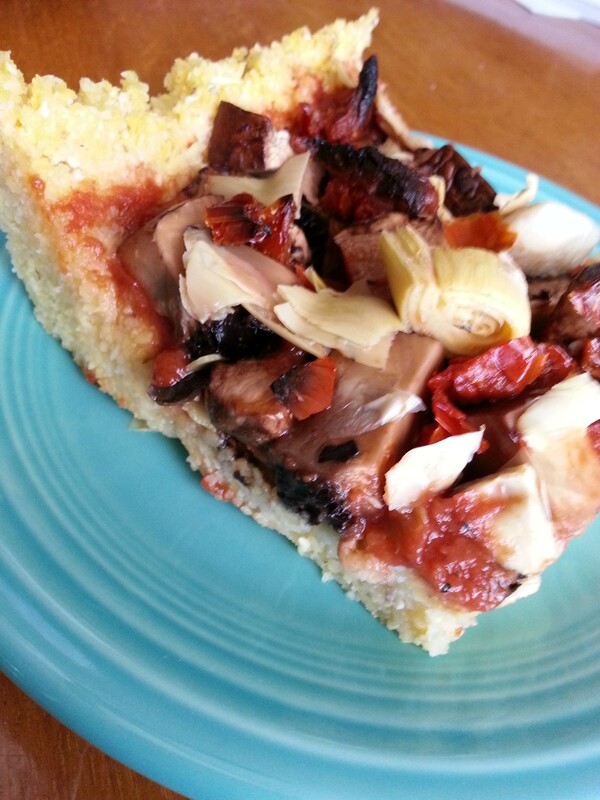 This little pie turned out delicious and I’ll be creating more polenta recipes in the future! Bring the water to a boil, add polenta and spices, stir until well mixed. Turn down heat to medium-low, simmer covered for 5 minutes. Substitute your favorite pizza toppings or add a little vegan cheese if you like. Have fun with your polenta crust and share your ideas in the comment section below.